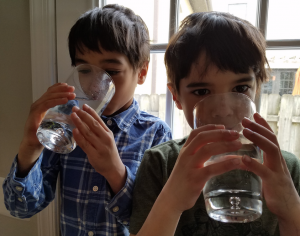 Sulayman (age 8): "We are doing this to help the people who don't have anything and we are doing this project to help other people who are making water. We are doing this so that it is fair for the people who have water to give to the people who dont have water. Everybody needs water. And we get clean water. We have to help people who don't have clean water." Yousuf (age 6): "Because they don't have water. So we need to give them money so that they can get water. And if you don't give them water then God won't be happy. If you have clean water then help them get water." Backstory (from mom): I showed the kids a video about the drought in Somalia. The kids were sad and worried. What can we do? Why dont they have water! They were asking so many questions and were genuinely concerned about helping people get water. They had ideas from filling up empty water bottles and shipping to Somalia to trying to take a plumber to Africa to bring water. So we researched how to help build water wells and this is how this campaign came about. Do what you can with what you have. Every dollar can make an impact somehow. The above are exact quotes of theirs as we built this page together. Money donated here will go to help build a well in Kenya, Sierra Leone or Uganda. 05/16/18 Imran Sayeed $68.00 MA great job Suleyman and Yusuf! 03/27/17 Iffat Mobin-Uddin $35.29 Way to go, Sulayman and Yousuf! May Allah put barakah in your efforts!! 03/25/17 Asma Mobin-Uddin $100.00 Great job, Sulayman and Yousuf! That's an awesome project mash'Allah! 03/24/17 Parveen Siddiqui $70.28 So proud of you! May God always guide you and protect you. 03/24/17 Sana Haque $26.03 Way to go boys!! So proud of you! 03/22/17 Asad Ansari $103.20 Good job guys! 03/22/17 Rizwan Haque $34.00 Great work for a great cause, good luck! 03/21/17 Mehreen Zaman $70.28 So proud of you both for caring so much about others. Love you! 03/20/17 Salma Hasan Ali $68.00 So proud of you Sulayman and Yousuf for caring so much for people who are suffering without water and food. 03/19/17 Zahra Kassam $35.29 Thank you for helping these people Sulayman and Yousuf! 03/18/17 Mike & Maryam Austin $34.00 Way to go! 03/18/17 Saima Siddiqui $70.28 Proud of you both for caring so deeply about the needs of others. 03/18/17 Anonymous $35.29 Keep it up!